A Record Year for FUN: Strategy convergence for SIX and FUN. Cedar Fair reported record results for 2016, beating analyst estimates for top-line growth but fell short of estimated EPS. Revenue was up $53 million, or 4%, over prior year. FUN’s success was driven by a 3% increase in attendance as well as a 2% increase in per capita guest spending at its parks. Higher occupancy rates pushed accommodations revenue up 6% over 2015. Adjusted EBITDA was up 5% at $481 million. FUN’s leadership pointed out that they are carrying forward a 19% increase in deferred revenue into 2017. The improvement in deferred revenue is the result of increased season pass sales, the success of their all-season-dining and all-season-beverage programs. Matt Ouimet said that FUN’s event strategy, including Halloween, Oktoberfest, and Holiday celebrations, was another success driver. In many ways, FUN’s reliance on a robust season pass program — in which we include all-season-dining and beverage programs as well as an event based strategy — reminds us of SIX’s playbook. We see a clear convergence of strategy: Develop reasons for guests to return often throughout the season, get them to trade up from a one day ticket to a season pass, and then find incremental revenue programs for in-park spending. The street is clearly buying today, with FUN up a $1.55 at 1:00 PM and running ahead of the broader market’s gains. SIX and SEAS are also up and outperforming the S&P 500. Investors apparently believe that FUN’s good news will be replicated on their upcoming calls. 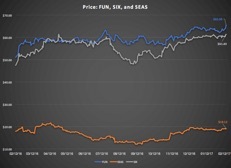 The chart below shows the stock price movements for FUN, SIX, and SEAS over the last year. The data label represents the stock price just before 1:00 PM EST. FUN and SIX do not, however, have identical strategies going forward. FUN is focused on accommodations as a driver of future business in addition to its amateur sports complex at Cedar Point. Both its increased focus on accommodations and venues for amateur sports tournaments point to trying to generate incremental unduplicated attendance. FUN’s leadership apparently believes that a season pass is not for everyone.